Joseph Fred McCaffery was the youngest son of Thomas and Mary Anne McCaffery. Thomas was born about 1896 in Fivemiletown, County Tyrone. Joseph worded as a tailor’s apprentice. Private Joseph McCaffery was serving with ‘A’ Company of the 2nd Battalion of the Royal Inniskilling Fusiliers when he was wounded at Passchendaele, where there was a major offensive on the Messines Road at that time. Private McCaffery died of his wounds on 22nd September 1917. He was 21 years old. 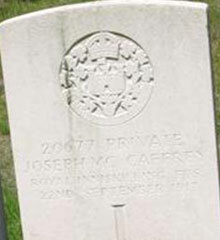 Private Joseph McCaffery is buried at Coxyde Military Cemetery, just 48kms away from his older brother Thomas McCaffery, who was killed seven months later.